Help Make a Difference in the Next 4 Weeks! For the May primaries, voter turnout in Rocky River was about 30 percent. This means that A LOT of our fellow residents did not vote. To make a difference in the outcomes on November 6th, we need to increase that percentage. Following are a number of proven ways to make this happen; and we need your help. Dedicated time to write postcards in support of Susan Moran Palmer, Democratic Candidate for the United States Congress, District 16 (Rocky River south of Detroit Ave.) Susan has just received the endorsement of President Obama! District 16 is the ONLY open Congressional seat in the state of Ohio and she needs our help to win against her well-funded opponent. Pick-up a packet of door hangers to distribute in our community. The door hangers list the candidates specific to our voting precincts. Simply drop them at each residence and move-on. 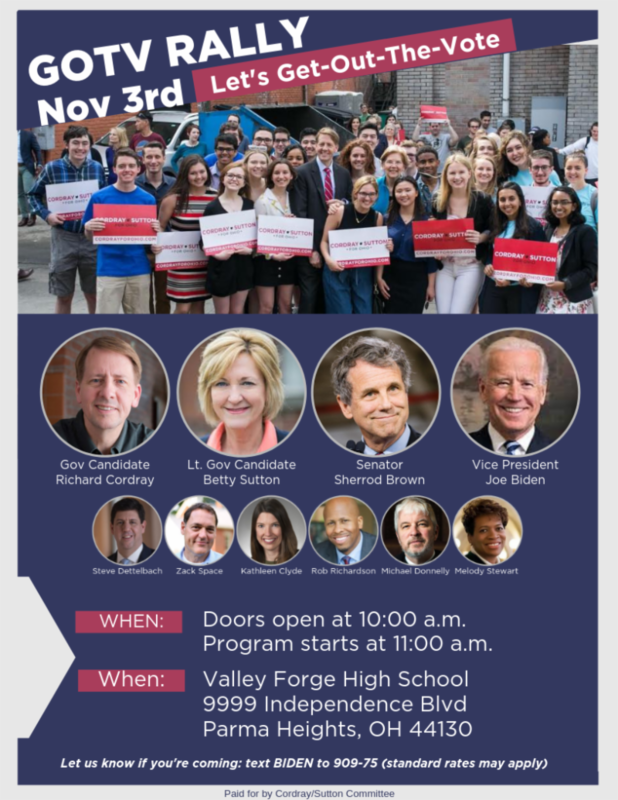 If you’re unable to join us on October 9th, please send an email to submit@rockyriverdems.org and we’ll get back to you with ways you can help. Thank you for being a part of the team that will make a difference in November to bring balanced Government back to our great country. The Rocky River Democratic Club meeting on May 30th focused primarily on the environment. Rich Snyder, the city’s Chief Forester, provided an overview of efforts to maintain our local environment. Dave Karpinski from LeedCo described the Icebreaker wind farm that will be installed off Cleveland’s shores next year that will generate 500 jobs and green power for 7,000 homes. Representatives from the Sierra Club and the Alliance for the Great Lakes were available to provide information on their respective efforts. Just two days after our meeting, the United States withdrew from the Paris climate accord; a decision that will weaken efforts to combat global climate change. Government and business leaders from around the world, as well as the Pope, denounced this decision. The City of Lakewood passed a resolution in support of the Icebreaker Wind Farm in Lake Erie. Contact Mayor Bobst at 440-331-0600 or mayor@rrcity.com and ask that the City of Rocky River pass a similar resolution to support the wind farm. The Ohio Power Siting Board (OPSB) regulates the siting of wind farms with a generating capacity of 5 or more megawatts. Email the OPSB at contactOPSB@puc.state.oh.us to express your support of the Icebreaker Wind Farm in Lake Erie. Include case #: 16-1871-EL-BGN Icebreaker Windpower in your message. Support one or more of the campaigns by the Alliance of the Great Lakes. They have a number of efforts to address pollution, invasive species, and more. Consider supporting the Sierra Club or any number of other organizations that seek to protect the environment. Call the White House at 855-980-5634 or 202-456-1111. Let the one who made the decision know what you think! Mayors, governors and corporations have vowed to pursue sound environmental policies without the support of the Federal Government. Let’s join them by taking one of the actions above to preserve the environment for our families and future generations. We also had two additional speakers at the meeting. Lauren Walsh from Rocky River Meals on Wheels let us know that they need volunteers in food preparation and as drivers. If interested, please call 440-333-6298. Heather Macalla from Fair Districts Ohio discussed the very important issue of gerrymandering, its affect on our elections, and the critical need to reform our congressional districts. Volunteers are needed to obtain signatures to get the measure on the ballot. Liz Gerstenhaber will be the point person for our Club. To support this important effort, please email Liz at: lizgerstenhaber@gmail.com. Next year, Cleveland will be the first city in North America to install a freshwater wind farm off its shores in Lake Erie. In addition to helping to protect our climate, Icebreaker Wind has the potential to create jobs and spur economic activity in Northeast Ohio. Dave will address how LEEDCo and Fred Olsen Renewables are turning a decade old vision of a vibrant offshore wind industry in the Great Lakes into a reality. Icebreaker Wind is a 6 turbine demonstration wind farm 8-10 miles off Cleveland’s shore that will produce enough power for about 7,000 homes. He will discuss the status of Icebreaker Wind and what it takes to put the steel for North America’s first freshwater offshore wind project in Lake Erie and build a new offshore wind industry in Northeast Ohio.